Changing the WordPress site url is only one part of a series of steps you need to take to ensure your WordPress site functions on the new URL. Review the following article for a full list of steps to migrate your WordPress site to a new domain name. You can change the domain name for your WordPress site any time you like, but there are a few important settings that must me made in order to make the switch. Make sure to carefully follow the steps below to ensure it's done properly. The following are instructions for moving a WordPress installation from one URL to a different one. There are different cases for moving a WordPress install, as shown below. If you've already moved your domain to a new URL, you are not able to log in since WordPress is configured to use the old URL. Another reason to update your URLs is if you need to add or remove www from your domain. For example, if you're using 'Cloudflare' with DreamHost, you need to add www to your domain. So if it was previously example.com, you would change it to www.example.com. After adjusting the URL, you may also see a browser redirect error when viewing your site. It may say "Too many redirects" or "The page isn't redirecting properly". If you're using an SSL certificate, the first part of the URL changes from 'http' to 'https'. If you've already made this change, you are not able to log in since WordPress is configured to use the old URL. The following two options explain how to change your HOME and SITE URL so you gain immediate access to your WordPress site and dashboard. If you've already made any of the changes above, you're not able to log into your dashboard. You can instead use phpMyAdmin to update the HOME and SITE URLs. Click your database in the left pane. Several tables appear below it. 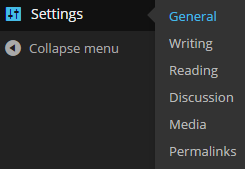 Click on your wp_options table. Locate the 'siteurl' and 'home' rows. Click the pencil icon next to each to edit. When you scroll over these options, "browse" will appear. Click the pencil icon next to each to edit. 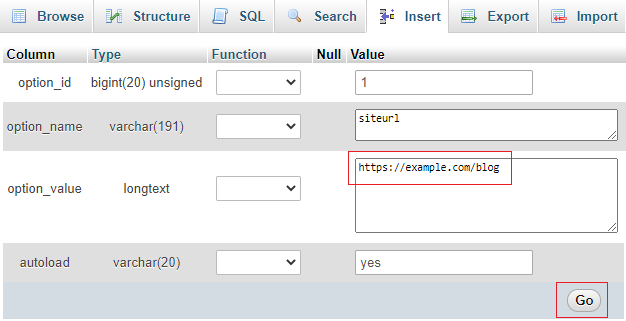 Alter the URL by typing in a new one. Click the Go button to save the settings. Do this for both the 'siteurl' and 'home' options. You should now be able to log into your site at example.com/wp-login.php. 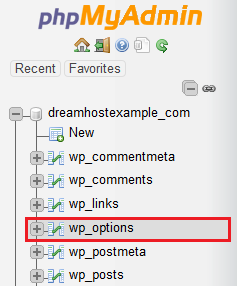 You can also change the URLs in your wp-config.php file. This is a little easier than editing your database and will give you immediate access to your site. The following assumes your Home and Site URL should be 'example.com'. Log into your site using FTP or SSH. In your WordPress directory, edit the file titled 'wp-config.php'. In that file, add the following lines just above /* That's all, stop editing! Happy blogging. */. If you visit your site now, you'll see you can log in. If you used options #1 above, the HOME and SITE URLs were updated in the database. You can confirm your site is now using the correct URLs in your dashboard. Navigate over to Settings > General. Here you'll see the HOME and SITE URL your WordPress site is configured to use. Once updated, remove the lines from your wp-config.php file. Check the 'Settings > General' page again and you'll see those fields are no longer grayed out. Article last updated April 09, 2019 19:30 PST.